The hit drama, which was watched by 10.4million people when it reached its finale on Sunday, depicts the relationship of fictional Home Secretary Julia Montague (Keeley Hawes) and David Budd (Richard Madden) the police officer assigned to protect her. Ms Hawes freely admitted she drew inspiration from her real life counterpart. 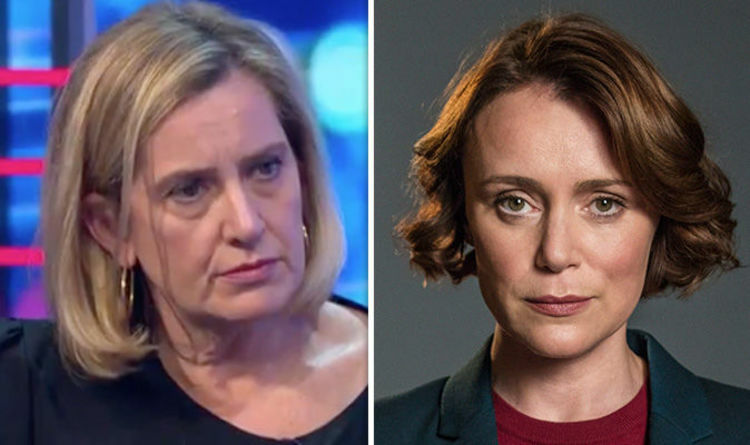 Now, in an apparent example of life imitating art imitating life, Ms Rudd told ITV political editor Robert Peston: “I’m delighted the writer has offered me a cameo in the next series, if he has a next series. Telling Mr Peston she had been “gripped” by the show like much of the country, she added: “I thought she did a marvellous job as home secretary, there were similarities and may I say it, some very clear dissimilarities. The fact Ms Rudd has drawn attention to the show may not be entirely welcomed by Mrs May, given Ms Hawes’ character is frequently claimed to be have ambitions of moving into Number 10. Neither will her hints about a second referendum, dropped during the same interview with Mr Peston. She said: “I think no-deal would assert itself and object to. “I think that a People’s Vote could be the result of an impasse. “Is it preferable to no deal? Absolutely. “If we can’t get a negotiated deal that the Prime Minister brings back through Parliament, then I think that we are in really uncharted territory constitutionally, and also because of the different factions going on in Parliament. “I think that one of the outcomes you might get is a Norway/EEA style deal instead of a no deal, and I know that various colleagues are looking at that. Days earlier, when asked whether she was eyeing a return to the cabinet during an appearance on the BBC’s Politics Live show, Ms Rudd said: “We will see, we will see the opportunities that might come up. Ms Rudd also denied suggestions she had taken the blame for Mrs May, her predecessor as Home Secretary, for the Windrush controversy – while pointedly not absolving her of blame. Bodyguard creator Jed Mercurio told Radio Times he would “absolutely” do a second series, but admitted he was worried about whether he would get one. He explained: “Some shows do nosedive at the end, or some piece of content could become incredibly controversial and affect the way the show is seen.